SmartPark JFK Customers say they have never experienced such exceptional customer service. SmartPark JFK is a reasonably priced parking lot close to JFK with free shuttles, offering a great cheaper parking alternative to expensive parking at JFK. Park with SmartPark JFK and experience excellent service, see for yourself why this is the smart parking solution at JFK. InstaPark absolute guaranteed best prices & InstaPark hassle-free cancellations, Book with ease, Book now lock in these unbeatable rates. When you arrive a valet will greet you and process a parking ticket for you. The SmartPark associate will provide you with a claim ticket and phone number to call upon your return to JFK. After you have retrieved your luggage. Double check the terminal number, as there are 8 distinct terminals at JFK. Call 1-877-535-7275 (PARK) and request a pickup. The dispatcher will instruct you on where you will meet the shuttle. The dispatcher will also ask for your ticket number so your car will be pulled into our Ready Zone. When you call the location the. Everyone at Smart Park is actually so nice and helpful. I called the other day to make a booking because I was a little bit confused about the online process, and one of the agents took her time and helped me through evrything I had to do online... I felt like a computer genius after i was done with her! hahaha. Thank you for your help and your time. I really appreciated it. Exceptional service! very well done. I will be coming back next time I choose to fly from JFK International Airport. I don't understand the hype about this parking lot... I mean it's definitely one of the better ones, but people are going crazy over it!! Living in New York can just make your travels even more frustrating... Getting to the airport parking lot in the first place is always a serious pain... I'm glad that I parked with Smart Park. Once I got there, all of the frustation was over and I got to the airport in just a few minutes. I experienced SmartPark for the first time, and it was wonderful! ... never thought I'd be writing a good review about a parking lot in New York... haha! Everyone working at the parking lot seemed to have taken courses on customer service, because it honestly may be the best i've ever seen. I booked with Smart Park just a few weeks ago. It was a very simple and straight forward process. I really appreciated that because I'm not very tech savvy. It wasn't only easy online, but once I got to the lot, things went very well as well. Thank you to everyone at Instapark and Smart Park for making my whole parking experience a smooth and simple one! I swear that JFK is one of the most difficult airports to find good parking lots for. Thank goodness for Instapark and Smart Park... Best airport parking in NYC. I'm very impressed with the customer service representatives at Smart Park. Everyone was very professional and helpful. I would give this JFK International Airport parking lot a 10/10! Covered parking is the way to go! Depending on the weather in New York of course... though it only seems to be really hot or really cold... Either way, covered parking is always the better option. Whether you choose valet or self parking, both options are great especially if you are parking at Smart Park in the first place. Best park and fly near JFK international airport!! Seriously... If you are looking for an airport parking lot to book with... don't even look anywhere else. You won't find anywhere better than here. My daughter was searching online one night, and stumbled across your parking lot... We were going on a trip the next week and still hadnt booked a parking space anywhere. I'm so happy that she found you guys because it was the simplest and most convenient parking lot that I could have ever imagined parking at. Since then, we have been to Smart Park at least a dozen more times. Thank you so much for taking customer service seriously. My family and I are so glad that we found Smart Park! I used to complain all of the time about the terrible service that airport parking lots seem to have a lot of. It's about time someone finally does something right when it comes to these parking lots! we will be returning for sure. JFK is actually quite hard to find parking for... Well... good parking... A friend of mine told me about Smart Park and it was history! I travel quite a bit for work and I now park there maybe once a month? .. Great deals & great service!! I don't think i've ever written a review before, but this is worth writing about!!! :) Smart Park near JFK is the best airport parking lot i've ever been to... I have always had terrible feels when id go to other lots... here I feel that my car is safe and that I have nothing to worry about!... Thank you to everyone who made Smart Park so damn greeat! Great job on this parking lot! Such good service. Everyone is actually so friendly. I'm really happy that I found this airport parking lot. I used to have a hell of a time finding a JFK parking spot, but ever since finding you guys I've been so much more at ease. Whenever i hear that I have to travel for work, I know that I'll be booking with you guys. It saves me the stress of looking for elegable parking spaces. Bless the airport parking heavens for giving me smart park!!!!! I feel like choosing a good parking lot is a huge part of making your trip a good one... In my own experience, whenever i've been worried about my car, I havent been able to focus on either work or my vacation... If you want to stay stress free on this vacation make sure to book with Instapark... and if you are in new york, park at Smart Park!! Seriously, this place is great and I always, always ALWAYS feel comfortable leaving my car here. best service EVER!! Whenever I fly from JFK I ALWAYS, always always make sure to book with smrart park. you are all great. I am always very impressed with the customer service. Not even just to me, but I notice it when you work with everyone else!! When I park at any of the Instapark locations, I feel like my day just gets a little better... Whoever hires these attendants really know what they're doing. Everyone who works at Smart Park near JFK has such a strong and likeable personality. I have ever been so impressed with the way customers are treated...I will definitely be coming back the next time I take a flight from JFK. Everything that everyone here has been saying is quite true. The customer serivce is outstanding and the parking lot is big, clean and very safe. There is nothing else that I need to say. You guys were recommended to me by a friend of mine. He raved about how good the service is for like 10 miutes... I didn't understand how one could feel so strongly for a parking lot... Now I do! you guys were really awesome. Thank you for everything :)! I feel like I'm apart of the Smart Park family whenever I'm there. Everyone is always so friendly... where did you find them all!? they're all angels... serious and true angels! JFK is a really hard airport to find good parkung for ... Seriously, I was almost done with airport parking, and then an angel flew down (it was actually my mother, and she didn't fly down, she just came over)... and told me about Smart Park... I was suprised that she knew about this lot before me .. but im very happy she did! Great service, great prices and very happy customers! The parking lot is clean, safe and very friendly... The shuttle buses are quite spacious and can accomidate many people. If you are standing in line, there is a good chance that you will get onto the first bus that comes. I love taking the shuttle bus from smart park. it's SO comfortable. Smart Park: Convenient... check. Affordalbe... check. Friendly... check. Great Customer Service... triple check! This JFK parking lot has everything you need to have a successful parking experience... I will be returning. This is exactly what I wanted in an airport parking lot... somewhere I could park and feel that my car would be safe and sound. Perfect!! I also don't mind the price either... Anyone who has park and flown from a new york airport knows how crazy expensive it can be... thank god for smart park! I have been going to Smart Park for a few months now, and I'm happy to say that I'm an official regular! I like testing places out for a while to make sure that they are consistant with good service and such... This is definitely one of the good ones..Everyone is super friendly, the location is very close to JFK, and i'm honestly not nervous at all to leave my car there. I will be returning on a regular basis from now on! I am a traveller, and I swear by parking at the airport... It just feels a lot better being able to drive your own car home without any hassle aafterwards. I used to think that shuttles were that "hassle afterwards", but it turns out that they arent that bad! I actually didn't mind them at all. Ill be returning for sure to save a few bucks! It's smart to park at smart park should be your slogan... you guys are great! Where have all of the great parking lots gone you ask? RIGHT HERE. Smart park is my favorite airport parking lot. I am very happy with all of the great service they've given me. I have ran into a few problems in the past with airport parking and public parking in general, but i have to say that i've only ran into minor issues with smart park which is better than the ones I was having before ... (broken in car, slashed tires).. stuff like that. I hope that my luck streak stays up while parking here! I swear Instapark is the king of all parking lots! Every other lot definitely has some compition with all of these instaparks popping up everyone. I am so glad with all of the service provided. I'm not sure why, but my wife doesnt seem to like this parking lot... I think she likes the quieter ones. But it's fine for me. I like the excitement... and even though it can get busy at some points, there is still a lot of space to move around in. Place, the shuttle buses are a good size to bring everyone who needs to get to the airport, to the airport. Great service. My aunt and uncle always come to your parking lot. I had never been before my first trip away without my family... but it was wonderful! My friends and I all got together and put our money in so that we could afford it, carpooled and took the shuttle to the airport. It's great since the park and fly is only a few minutes away - it makes for a really good ride. When we got home, the shuttle was actually waiting for us at the stop at the airport... It was nice since we were all so tired and seriously didn't feel like waiting. Thank you so much to my aunt and uncle and also to smart park for making this successful trip possible! haha! We will be returning on our next trip. My boyfriend has some serious trust issues when it comes to where he leaves his car and for how long... Me? i'd rather leave it somewhere that someone is looking out for it... My somewhere is Smart Park. Its wonderful to feel that people actually care about the safety of your car and not just making money for their company. Let's just say that my boyfriend is a lot more comfortable when we go on long trips now becuase he knows that his baby will be safe! Whenever I take a flight from JFK I always book my parking space with you all. I always recieve the best service and I am always the happiest leaving you guys (which must mean something)... see you next time! I was really exicted to try smart park becuase of all of the great reviews and hype it was getting, and I have to say that it was nothing less than what everyone has been saying. I am so glad to have found a new airport parking lot that does everyhing I need it to do. I hate not driving to the airport, and now I can every single time, thanks to Instapark!! I park with different Instapark parking lots quite a bit whether i'm going on a cruise, on a plane or am just daily parking... They always seem to have really great service and friendly staff. I'm glad that I've found a park n fly nearby JFK !! Its actually been qutie hard finding one that i've liked around there. thank you all so much for your hospitality and kindness. I arrived at Smart Park a little bit early on the day of my reservation, and instead of waiting around until my time, the staff let me park without extra charges. I was so thankful to get to the airport earlier so I could sit down and have something to eat. Thank you again. I don't think i'm going to ever park anywhere else (when flying from JFK, that is.) I am so happy with the service. Everyone is very nice and willing to help if you have any questions or concerns. I am very blessed to have a parking lot that I am able to park with like yours. I will continue parking with you. I love parking at your airport parking lot. It is so easy to get in and off to the airport, and it's nice to see people actually enjoying their jobs for once! haha! Thank you all for the best airport parking experience that i've had in a long time. Im an old lady so i've seen a lot of customer service blunders. These kids seem passionate about parking (not sure how anyone could be)... but anyways, i'm happy to have found this lot. I am always so impressed with the service at JFK airport parking lots. I find that a lot of them are quite good, but what sets this one apart from the others is that this one has covered parking! that's a huge perk especially when it's either snowing or too hot outside... (New York seems to have short inbetweens of those weather conditions), but non the less, this is a great parking space if youd like your trip going smoothly. Everyone at Smart Park is so nice! I should come here when I get tired of being bad mouthed by New Yorkers in traffic! Lol I will be returning. My wife and I started coming here just a few months ago. We've gone away three time since, and each time we've been very impressed with the service and standards that each of the employees have for themselves. It's very nice seeing young people have a good time doing their jobs. Also, I love the shuttle buses and the service that they provide. Whenever we've gotten there, the shuttle has been there (lucky us)... either one of the employees or the driver help us with our bags (without fail), and then we hop onto the bus with the most comfortable seats in the world! (I swear)! Thank you all so much for everything!!! I love parking with Smart Park. There aren't many airport parking lots with covered parking spaces near JFK, but there are here! thankfully. I don't feeel like leaving my car in the snow again this winter. I am so overjoyed to have a place to safely park my vehicle and can be sure that snow isnt messing it up haha! Smart park also has great rates! especially for new york parking! Ugh, I am always so stressed going on vacation... I feel like something always goes wrong somewhere. You can never catch a break while travelling (or maybe I can't).. but ever since I began coming to smart park, I have found that my trips have been a lot smoother! maybe it just feels that way because virtually nothing has ever gone wrog for me here. yall really know how to make customers happy... I got valet parking for the first time at your parking lot and boy was it fancy. im so glad that i decided to treat myself to something like that.. i'm very happy that it was with you guys too, becuause even though it was my first time, i can tell that you do it right. Thank you for everything once again my friends. I love smart park... It't the first parking lot where the attendants aactually smile at you. I am very impressed! haha! I don't even know why anyone even goes anywhere other than Smart Park... seriously, this place is pretty big... WE CAN ALL FIT! haha. Great rates, and great service. Whenever I fly from JFK I always make sure to book a parking spot with Smart Park! It's always quite busy, but it's for a good reason. Friendliest service in all of New York haha! ive been to smart park on mmultiple occations, but have never written a review though I love it so much. I really love coming to this park n fly just because i know that I wont be there for too long. I wont have to fill anything out, and if i dont want to, i dont have to talk to anyone! I was having a lot of terrible luck when it came to public parking... Last time, I had my car broken into and my stuff stolen.. This is the first time I parked at smart park, but I was talking to one of the peope working there and he was saying how there has never been something like that to happen. I was so suprised! I will definitely be coming back so that My car never gets broken into when i'm not watching haha. I cannot believe that I made the mistake of NOT going to smart park for however long it's been open! Worst judgement on my part ever... A lot of the time, airport parking lots are just a pain in the neck... always busy and crowded and annoying... not this one!! I always feel quite comfortable even though there are just as many people... Not sure why... maybe they arent as angry for some reason. lol. I will continue coming back here for as long as possible! I am so happy with the service here. I give you guys a 10/10!! You know what... I've been to a lot of airport parking lots, and Instapark does breed great ones! I'm always very happy with service and convenience. I will always go to Instapark parking lots. I'd like to tell you that Smart Park isnt that great... (just because I dont want it to get any busier)!!! Please don't park here and make it anymore crowded for me. lol, I wish i could reserve the whole lot out for myself!!! I want it all to myself! But seriously, i love this lot. I always get valet parking and its always on point. When I got home from my trip, my car battery wouldnt start... great! Thanks to the great staff, I was off in no time. One of the guys working the desk was nice enough to give me a jump from his own car. Thank you! Nothing helps me sleep at night more than knowing that my car is safe and sound in the Smart Park parking lot... It is so easy to leave your car here because you know that there is a security guard and security caemras everywhere to make sure that no one is messing with your cars! Thankful for you guys! See you when I get back. I'm so happy to have found you guys!!! :) I love Instapark & Smart Park near JFK! I am always very happy with the service here at Smart Park. I Would absolutely recommend it to anyone reading this. I makes me feel better that there are security guards and cameras here. my car is always being watched!! I feel like the only people who go to other airport parking lots are those who have been going to a certain place for years adn dont want to switch because they are used to it... Well, if you are ready for a good change in your life... i would switch the Smart park! It was a litle bit too busy here for my taste, but what do I expect? It is new york, and it is an airport parking lot... Next time i'll take a cab to the airport. I love how cheap this airport parking lot is... Usually JFK lots are a lot more expensive. It seems that Instapark lots are better value than competitors. The valet service at Smart Park near JFK is the best! there is always someone there, ready to help you - no waiting around. From the 6 times i've parked with you guys, all 6 times i've had great service. I hope that you are all recognized for the great services that you do. I am so happy to be going back to Smart Park next tuesday... you guys are seriously the best airport parking lot. If you are an airport parking person, this is definitely one that you have to check out... A lot of people dont like airport parking lots, but this is one thats for the books! I've always had great experiences here. I havnet parked at Smart Park yet, but i've booked, and it was the simpliest process EVER. I have honestly never booked anything that quickly in my whole life. Thank you for making booking a trip a little easier thann usual! SMART PARK IS THE BEST!!!!!!! I'm not suprised that the parking lot was as busy as it was... This is obviously one of the better parking lots nearby JFK. Whenever I buy a plane ticket from JFK, right afterwards, I always book a parking spot here. Such a great lot... I like that ther is covered and uncovered parking incase the weather is bad. If you are booking really far in advance, you are able to switch up your spot on the day of if the weather is bad, they are really good for that. dope parking facility! you really dont need anything more than this. I've alreayd told my friends about you, and there is already 1 who booked. If you need an ambassador let me know ;) hahaha. This is quite a busy parking lot, but it doesnt even feel that bad since there are no lineups you have to wait in... All you have to do is park and head over to the shuttle bus stop... The rates arent too bad either! especialy for new york long term parking! My wife, daughter and I parked with Smart Park and we were all very happy with how everything turned out, and how organized the lot was. Everyone seems to know what they're doing, and they do it well. I dont think i'll ever park anywhere else when it comes to flying from JFK international. Thank you for giving me this great parking option. JKF International doesnt have my favorite parking lot... I much perfer Smart Park... It is quite and easy... ALl you need to airport park. This was my first time using Smart Park and I'm so glad that I did. I usually give myself some pad time to get to the lot, and to get from the lot to the airport, but I honestly dont think I needed it... I mean, the shuttle was there when I got there (so that was lucky), but even without that, things went quite smoothly too. Thank you to everyone who had a hand in making Smart Park & Instapark possible. All of Instapark's parking lots have been great. With any other airport parking lot, i've always had issues... Those other lots have a ton of compition with these instaparks popping up everywhere! Smart Park is really close to JFK and has great rates on regular and covered parking spaces.I would totally recommend this to anyone who is looking for a new airport parking lot. My whole family and I went on a vacation and parked here with Smart Park. The shuttle bus was free for all of us. I know that sometimes after four people you get charged for each of the people after four, but here you don't! wonderful and cheap parking lot for those who are travelling with many people. I have been coming to this park n fly for a few months now (I travel frequently), and everything always seems to go quite smoothly. Everything is organized quite well. A really great JFK airport parking lot!! I needed to book a JFK parking spot last minute, and the Smart Park employees were very accomidating. It was no problem at all. I was very happy with the way things worked out. words can honestly not describe how great this parking lot is... I have only been here once, and for the 20 minutes I was there in total, I can see why so many people really love it. Thank you for all of the great customer service as well as the inexpensive rates! I will definitely be returning and reccomending you to all of my friends and family. The parking here is almost $18 a day.. You CAN get it for cheaper, but that would also mean parking a lot further away from the airport... you have to choose between convenience and money here people. There are a lot of things to consider when airport parking.... Customer serivce, price, location and anything else that is important to you... If you are going to consider using Smart Park, you will most likely get everything you need in an airport parking lot. I'll be returning with the wife and kids. My boyfriend and I were looking for a good airport parking lot for a while. 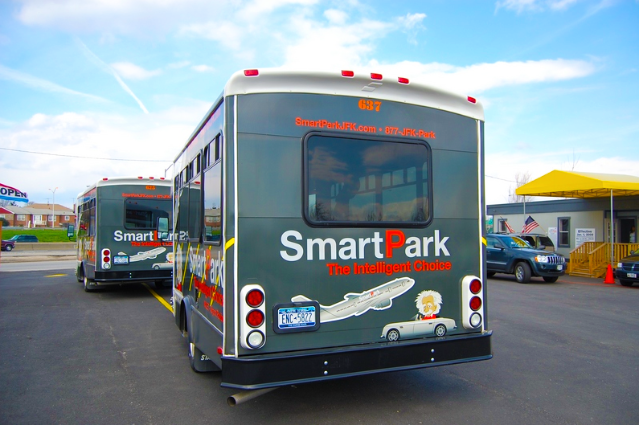 We travel a lot and wanted to put our car in the hands of people who actually cared about the well being of their customers... We found Smart Park and have loved the staff and how they handled their customers. We havent gone elsewhere since. Smart Park is the smart choice (haha). This is the least expensive airport parking lot near JFK... There are some that are less expensive, but they are further away and aint nobody got time for that. You should always check the weather before you boook your parking space. You can choose if you would like to park in an uncovered or covered parking spot.. The great thing about Smart Park is that if you book way ahead of time, you can call anytime to change your reservation! I love being able to park at the airport, it's so easy just walking out to your car, and drivng home after a long trip... SMart Park is so close to the airport that you wont even notice you're off the grounds until you're there... it's quick and inexpensive - just how i like it! What ever happened to good customer serivce you ask? .. it's living inside of every Instaparking lot around the united states... seriously! everytime I book with instapark no matter where it is, I have always had a good experience. Thank you so much for hiring the best and putting your customers first. Everything was going wrong for me last wednesday (when I flew out)... Everything that could have went wrong did, except for my short time at Smart Park. Thank you for the great service, and for being a breath from the day's terrible events. I love Smart Park near JFK! I have tried many Instapark parking lots, and they are all normally quite good! I always trust the lot if it is under Instapark. I always come to Smart Park. It's the smartest place to park in New York if you ask me (or anyone else who has parked there aparently)... I'm so happy that others have recognized the quality of your great lot!! When coming to Smart Park, I always make sure to get valet, covered parking. It didn't start like that... Once I saw how great all of the staff was, I knew that I wanted to give more to the company... Now I get the complete works! I don't think i've ever met friendlier people in New York! haha, the staff are great, and the parking lot service is also quite unbelieveable... whenever I use smart park, I always get valet, which isn't too much more than regular parking, but it is totally worth it... it saves you quite a bit of time. My pals and I carpooled to the airport parking lot, which made the price a lot cheaper (split between 4 people...) .. Just soemthing to think about! I'm so excited to have found an actual airport parking lot that cares about the well being of your car... I don't understand how some parking lots don't have security cameras or even guards?! There are also contracts that say if anything happens to our cars it isnt their fault... Maybe if you would hire more security guards things like that wouldnt happen.... Sorry for ranting. But, i'm very happy with the face that Smart Park has tons of security. Makes me feel a lot better, and like its worth my money. While parking here at Smart Park, I noticed how friendly and kind everyone around was. It was wonderful... I almost felt that their kindness was rubbing off on me and everyone around! haha. Great experience. I will definitely be returning. I made a reservation last month for a parking spot here, and last minute I had to cancel... It didn't seem to be a problem at all... and my card didn't get charged at all... I was expecting a cancelation fee or something... but nothing! love that. My parking experience was great! The shuttle back took a little to long to pick us up, but other than that was good the price is not that bad. I was very happy with the service. But later when I arrived home I noticed that my car scratched in the left corner of the front bumper. This is not acceptable. thanks. Therefore I am not happy about this issue. My car it's brand new from the year 2016. Honda Odyssey. Great Service....quick and professional. No wait time. Couldn't have been easier. Would definitely recommend and use every time I fly. The whole thing was really fast and efficient on top of it being in an easy to find location. It was really a great experience and I couldn't have asked for anything more. I knew getting to JFK was going to be tricky so when I found this parking lot I was really happy. I'm really pleased with the service and how everything turned out. I came back from y trip a little worried about how my car was going to be but it was exactly the way I left it. That's all I could ask for! I've always been scared to leave my car somewhere but this was a safe spot, I could tell right away when I pulled up. I'm really glad I found this place, since the staff was so helpful and the experience was truly great. The location is literally perfect. not even 10 minutes away from the airport. This is the kind of lot you need when you're in a rush and luckily because I booked it all ahead of time, they were ready for me when I got there and so was the shuttle bus. It was really awesome. This was a really great experience. Staff was awesome and my car was exactly the way I left it when I got back! Win ! NO COMPLAINTS truly a great service that I'm really happy that I booked. It was so easy to find and the security and video cameras helped me feel really safe leaving my car there. I knew that I wouldn't have to worry about it while I was on my trip. The second I picked up my car I I was already telling people about my experience here and recommending it to them. For a location so close to the airport the price is really affordable and the service is impeccable. To have valet service in all that? Bravo! Really great. PERFECT service!! Good work guys! When I called the customer service number at 877-535-7275 NOBODY EVER ANSWERS or picks up. It's really so unprofessional and I was just trying to book ma spot here. I guess they don't ever want my business because I wasn't even able to book a spot so what's the point? I ended up paying THREE TIMES the price I wanted to get because I had no choice but to use another parking service. What a waste of time that was seriously. The price was really reasonable considering all that you get and when you compared it to the other lots in the area, it's really a steal. I only had to pay for the days and hours I used to the lot, and they billed me down to the hour instead of the entire day like I worried they might. Really amazing! It was tricky to find at first but I called the customer service line for some help with the directions and they were really helpful about it. I found it in about 20 minutes and after my car was parked I was surprised by how quick the whole process was. Efficient! The security and video cameras were the selling points for me and this lot and I just knew that my car was going to be safe. The safety was really important and they delivered on that so for that I'm very happy. Definitely will consider booking with them in the future. I found my go to spot! There are so many parking options in a city so huge that you get lost in them but when you find one with great pricing, great services (even valet service) and a staff that actually WANTS to help you it's like finding a needle in a haystack. I was concerned about leaving my car here at first because I wasn't sure if it was going to be exposed to the outside elements or not. I didn't want my car to be sitting in all kinds of weather for the few weeks that I would be gone, so when I saw it was covered I was so relieved! In the past I've been really scared about leaving my car in a parking service because I wasn't sure it would be watched but seeing the security guard and the video cameras put my mind at ease and I knew it would be just fine. I was really blown away by how helpful everyone here was and how much better it made the beginning of my trip. Not having to worry about my car while I was gone did wonders for my stress levels and when I came back to find it parked outside ready to go, I was really pleased. I knew that leaving my car parked along my street was not going to work, especially with all of the heavy snow New York was expecting. This parking lot was not only right by the airport, but also covered so my car was safe and stayed dry the whole two weeks I was gone.